That was the plan all along wasn’t it? Pick up your presents at the I am ARG Facebook Group and get daily presents in the form of asinine tweets from my twitter feed @IamARG! On monday we’ll be going back to the regular MWF schedule! Thanks for your patience the last two weeks folks! 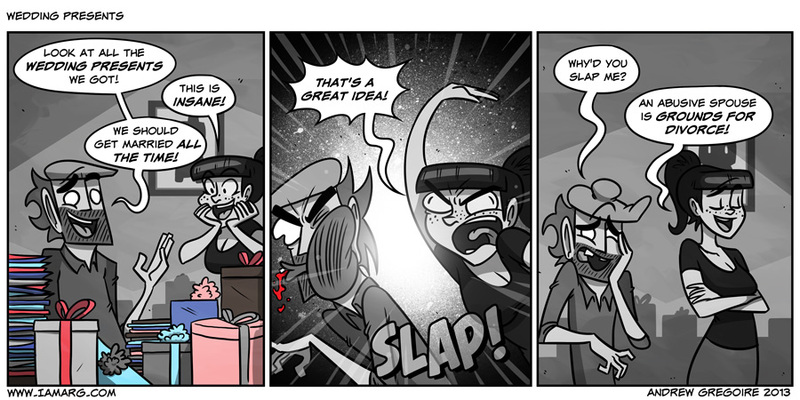 Too bad spousal back handed slaps are Connery approved..
Only problem with that plan is that you’ll probably end up with 10 toasters that you don’t need! Just cheat, break up, re-marry, repeat! Hello. So I just finally caught up with your comic. Just wanted to say it’s a really awesome comic and that you’re doing a great job.